2018 Update: We still like these interview tote bags, but you may want to check out our most recent roundup of the best work bags! It’s been a while since we did a roundup on interview tote bags, so I thought we’d do one now (see our 2012, 2011, and 2010 roundups here). 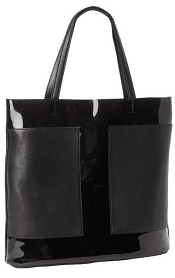 I’ve said it before but I’ll say it again: in my mind the perfect interview tote has structure (that it keeps if you set it down), is a muted color like black, and doesn’t have a ton of logos or other bling on it. In terms of size, I think it should be big enough to fit a file folder as well as whatever else you would normally carry in your purse, but not so big that you could fit a beach blanket or groceries in there. In the past I’ve always preferred nylon to leather (much lighter weight) but I think readers have finally convinced me that the weight doesn’t matter that much. (What do you think, guys?) We’ve included some of the classics in previous roundups (such as the Kate Spade Maryanne line, most MZ Wallace bags, nylon Tory Burch totes, and Lo & Sons totes) so I’ll only include the newer ones in today’s roundup. Readers, what are the top qualities you look for in an interview tote? Have you made any great purchases recently? The Michael Kors Jet Set Mac Book tote. Love, love, love it. I’ve been considering the regular (not macbook) version of that tote for a while now. Some of the reviews say that the skinnier straps make it too heavy/uncomfortable when it’s full. Is it still comfortable for you when it’s full. Sorry that I didn’t get back to this earlier. So, my opinion: I’ve never carried a heavy bag that wasn’t a little uncomfortable on my shoulder. This is about the same as all the others…. with just the mac book and ipad, phone and wristlet (and misc junk that has settled around) it isn’t bad at all. add in a few heavy files and yes, it is a little bit burdensome. But no more so than any bag I’ve overloaded. Bonus that I didn’t know about until I got the bag – best key fob holder I’ve ever had. Finally stopped losing my keys in the bottom of my bag. I’m a junior associate in BigLaw. My laptop I bought in law school is about four years old. I don’t have a reader/ipad/Kindle/etc. I’m trying to figure out what I want my tech set up to be in the next six months or so, and I’m not sure what I want to buy. A monitor to connect my old laptop to (and then soon a new laptop)? A tiny laptop? an iPad? A powerful new laptop with a decent sized screen? -I don’t have a huge TV or movie habit and have lived without a TV for years, but have recently started watching more hulu, etc. I don’t have any subscriptions or cable. Why not a desktop? It doesn’t seem like you need to carry a computer around with you most of the time, and a desktop with a nice screen (you could even hook it up to a TV) would suit most of your needs. work laptop-13″ lenovo, take it home every weekend, sometimes more often. Small enough to fit in my larger tote style handbags. At the office, I dock it and have 2 monitors. At home, I either work on the kitchen table just with the laptop or plug it in to a big monitor in husband’s home office if I’m doing tedious spreadsheet work. We have a google “smart” tv by LG & apple tv–I barely ever watch tv at all anymore if it doesn’t entail Dora or a little pony, but this setup connects to all of the digital sources my familty uses-netflix, amazon prime, youtube, hulu, etc. as well itunes store. It’s a lot of stuff now that I look at the list, but I definitely feel like I simplified my life when I stopped pretending that I needed a “home” computer for anythign other than storage. Now that cloud based storage is so easy to deal with, I’m phasing out the macbook entirely so I will just be smartphone/kindle/work laptop. This is almost my exact set up. My “home” laptop is basically just for my photography hobby. I have a big monitor that I can plug either my work laptop or my home laptop into as needed. It makes working from home MUCH better to work on a real computer screen and not a tiny laptop screen. I’ve also bought a keyboard and mouse and use those when working at home, as well. I think I may need to get at least a mouse/screen/new laptop as my current one is at capacity. I also have an ipad + keyboard that I have used in a pinch to do a little work while on vacay. You should get a MACBOOK PRO with RETNA display. Myrna has one and she LOVES it!!!! I have a MacBook Air, but I do NOT have a built in DVD drive so I can NOT play movie’s without carrying around a dumb DVD drive. FOOEY! The RETNA display is great. Dad says when my machine goe’s, he will replace it for me with a MACBOOK PRO. YAY!!!! Has anyone tried the Dr. Ellie “Kiss Your Dentist Goodbye” plan? I’ll include a link below. Curious if anyone’s had this work for dark spots and decreased dentin from over-bleaching. Yes! Used it for a couple of years now. It definitely makes my teeth whiter (took about 3-4 months to notice a difference), but the best has been the improvement in my dentist visits. No cavities, much less plaque, and just overall healthier teeth/gum condition. I followed it religiously for the first three months (where I saw the most improvement) with all the rinses and xylitol x2 day, but now I do the full “treatment” every night, some xylitol gum during the day, and just brush my teeth with the regular crest in the AM. Still great results. It doesn’t mention flossing, which is a pretty big step. That seems odd to me. I’m trying it too. Has anyone done it for a long time? I’m 5 months in and seeing some staining, which seems normal. Also, has anyone has enamel regenerate? Dr Ellie doesn’t recommend flossing because she believes it’s easy to do incorrectly (which can cause damage). Yep, no flossing, she says it actually damages gums. FWIW, my dentist has stopped bothering me about not flossing once he saw the results of this system. This is not evidence based. Unless there are legitimate research studies that support not flossing, this is nonsense (and it is). Good luck with that. You will be making a dentist some big bucks down in 20 years when you need implants. Also..your dentist has stopped “bothering” you about flossing because he/she has given up. It will go nowhere to try to educate someone who doesn’t believe in research-based treatment..you consider them to be “bothering” you and therefore are not even listening. I think I have a Nordstom addiction. I did limit my NAS shopping to a handful of brands and items on my list…. Has anyone had any great finds? I met with a personal shopper there in June and bought things from a few brands I hadn’t tried before (Joie and Kate Spade in particular). I just ordered another Joie blouse, and some undies, and some jeans, and a skirt. Whoops, just realized this was a Hunt post, not a coffee break! I wouldn’t bring any large(r) tote bag to an interview. Because then, what to do with it? I wouldn’t want to put it up on the table/desk, and depending on the chair may not be able to hang it. Just put it on the ground and hope you don’t step on it or get your chair on it? I haven’t interviewed in a while but I think in the past I’ve just carried a leather portfolio. I just sit it on the floor next to me. I usually have a change of shoes, wallet, and pantyhose so a portfolio doesn’t cut if. I don’t think it’s usually that hard to avoid stepping on a bag next to your chair. Yes slight exaggeration, but with my mix of klutziness and bad luck why leave it to chance! My point was, what do you need to bring into an interview? For everyday I use the smaller sized Michael Kors Hamilton. The bigger my bag is the more junk I tend to carry around. For those of us who are reliant on public transportation, you want something big enough to shove your leather portfolio; commute shoes; wallet; keys; lipstick for touch-up; and other sundries into. If you have a car to ditch stuff in, I guess it doesn’t matter. It has so many pockets, holds my 15″ MacBook, and best of all, I can unzip a pocket in the back and it fits on my travel rolly bag. Yay! I bought this last year (while still in grad school), and am about to put it to proper use in my new job in two weeks. Glad to hear the reviews! For me, the T.T., which is perfect for my 13″ laptop. Love the brand. Shopping challenge! I was in a meeting this morning and the presenter had the most awesome shoes on! They had a navy patent cap toe (pointed) and a navy and white woven “body,” sling back and a 2-3″ heel. So cute, but I have no idea how to find them. They sound like Tory Burch to me. Submit to TCFKAG’s blog – she’ll find them! Her blog is TCFKAG.weebly.com I believe. Does anyone have the Rebecca Minkoff MAB tote? I’ve seen it in stores and really like it – just wondering if anyone has personal experience. I have it – in the bright (cerulean) blue and I love it! That blue is not interview appropriate (unless you’re my age and don’t really care anymore), but a darker color would be. What I like: good size without looking like a beach bag; good pockets inside and out, and a light printed lining. Nice soft leather but still has structure. Negatives for those who care about such things: no shoulder strap, and the handles may be a bit short for wearing on the shoulder over a winter coat, and no zip closure at the top (there is a snap.) Most days, I still use my ridiculous looking but amazing Tumi TSA-friendly backpack because I shlep so much stuff, including a relatively large laptop back and forth to the office, but I love the MAB tote for client meetings. I have the Zara Office City Bag for interviews and other ‘formal’ things – I have to interview for placement years fairly soon. I would definitely not carry a nylon tote bag into an interview. The basis black bag for the office is the next big investment piece i’m searching for at the moment, starting as a junior associate in a management consulting firm this fall. 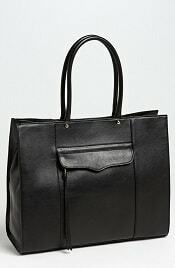 I’ve had my eye on the Phillip Lim Pashli bag in black for a while (http://www.shopbop.com/pashli-medium-satchel-31-phillip/vp/v=1/1580775992.htm?folderID=2534374302181715&fm=other-shopbysize-viewall&colorId=12867 ) but i’m concerned that it night be a bit too edgy for a semi-formal office, even for a young consultant? Your critical views and opinions would be highly appreciated! In black it doesn’t really stand out as too edgy to me. i think it’s super cute! wouldn’t be big enough for me though. $825 kills it for me. I love this bag so much. Luckily for me, at over $800 it’s in the gaze at longingly category and not I can make this work category. But please buy it so I can live vicariously through you. 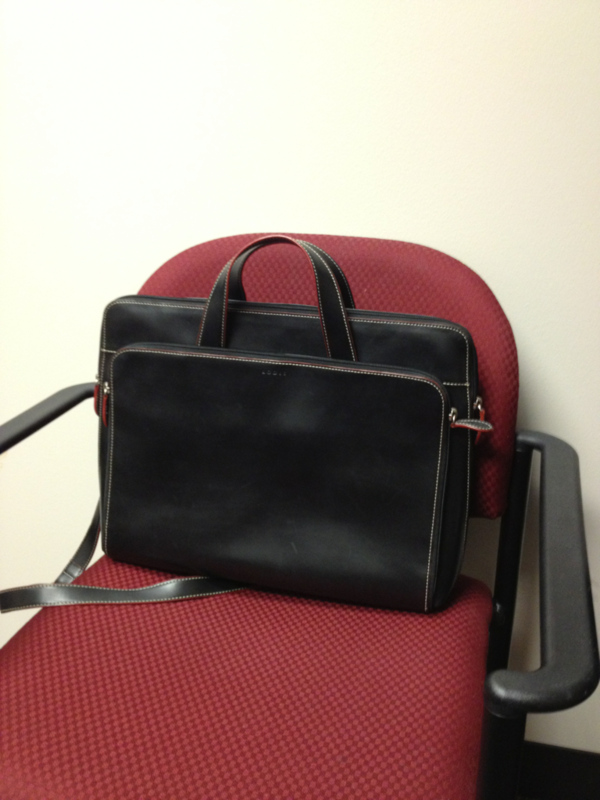 I find this bag a little similar to it… Would it be appropriate for professional conferences/interview environment? My amazing co-worker told me about it and literally peer-pressured me to get it (so we both have it) in navy! (Also, my friend already has the Prada Lux Tote and she was still blown away by this bag that she bought one, too!) It is such a steal for $358… and it is saffiano leather! Most stores have the black and navy on backorder so if you have a Michael Kors store near you, that’s your best bet. I wasn’t a fan of MK bags but this one is so beautiful I just had to have it! Does it fit a 15 inch laptop? Lodis has great bags for interviews or for out-of-the-office meetings. The leather holds up well. It’s $295, which is much more than I’ve ever payed (grad student, never crossed into triple digits before), plus it not being on sale kills me . . . But it is a lovely bag, and perfectly interview appropriate. Unfortunately I think my bag is an older style. But they have soooo many beautiful slim, structured leather bags, and I love the little pop of red in their black bags. I in school and need to look for a fulltime job soon. I have been looking for the perfect bag to bring to an interview and professional conferences. Has anyone considered these bags from Macy? I’m only in my 20’s and want to avoid “granny”-like bags, and preferably find something that fits a padfolio. Have spent weeks cruising sites and reviews. 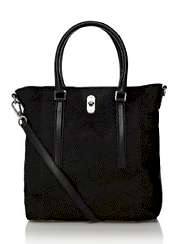 The large EW city tote from coach gets rave reviews. Thinking of trying the slightly smaller version – medium city tote. Any pros/cons vs the NS city tote above? Love the NS format, but are Straps too skinny on this one for a fully loaded bag? How do I tell my husband about this surprise pregnancy? What’s wrong with having opinions about appearances of people you date? Help me dress better with “smart casual” at my new job. Parents: How does restricting screen time help? My manager can’t seem to decide anything.